Most children love electronics. Even if your child doesn’t much care for flashcards during speech therapy, there’s a good chance he will give it a try if it’s on an app for an iPad or iPhone. While the majority of speech therapy apps are geared toward an English-speaking audience, there are a few gems for Spanish-speaking children as well. Spanish Articulation Probes ($29.99) is a flashcard app. It contains over 500 flashcards to improve articulation. The images are separated by phonemes, mode of articulation, and phonological processes. The app also keeps track of your child’s score. Play2Learn is available in several languages, so make sure you select the right one when purchasing. Available for $1.99, this app is intended for children ages 3 to 12. The app is intended for use both by bilingual children and children who are learning Spanish as a second language. The app teaches vocabulary as well as correct pronunciation in the form of a game. Your child can also tap the screen to hear the word pronounced and see its proper spelling. The app contains over 200 words. More complete versions are available to purchase. Spanish Artik, available for $19.99 from Smarty Ears, was developed by a speech-language pathologist (SLP). It offers over 450 images and corresponding sounds to encourage correct pronunciation. It is primarily an articulation app. The app contains all of the consonants in the Spanish language. Your child can also record his voice and hear it played back. The app keeps track of correct and incorrect pronunciations. If you would like your child to work on specific sounds, you can adjust the settings for those sounds. This app, available from Smarty Ears, was also developed by an SLP. It is intended for infants and toddlers. The idea behind the app is to expose very young children to the sounds of the Spanish language to facilitate speech and language development. The app uses sounds, words, and phrases. The app offers visual imagery as well as audio. This popular app, available in both English and Spanish for $2.99, uses a mouse named Milo to teach children language skills. 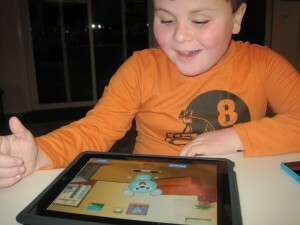 The app uses fun, engaging animations to keep children interested in learning verbs. As verbs are introduced, the written word pops up on the screen and audio is also used. Your child can also request to hear the word in a sentence. As your child progresses through the lesson plan, he can reward Milo by feeding him cheese or watching him dance. We have several apps like this in India, where bilinguality brings out a whole different array of issues that need to be addressed when it comes to finding communication aides. Why do you think these apps are better than others out there?